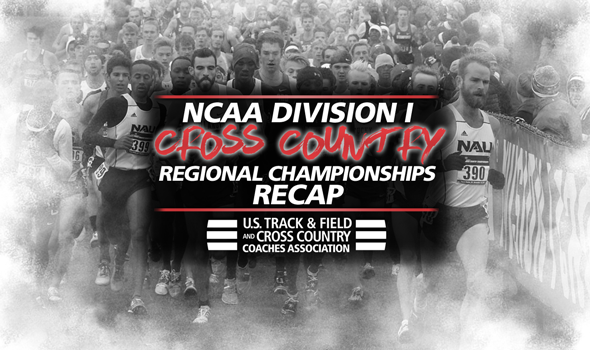 Each of the nine NCAA Division I Cross Country Regional Championships is in the books. The day started in the South Region and ended in the West Region. You can search through the results by visiting Regional Championships Central. We know you read a lot in our Regional Championship Weekend Preview, so we’ll make it easier on you. Here are a few odds and ends from the day’s action across the nation. Colorado and Northern Arizona entered the Mountain Region Championships ranked No. 1 in the Men’s and Women’s National Coaches’ Polls, respectively. The Buffs and Lumberjacks weren’t alone in the meet as they had to go through the respective No. 2 teams – New Mexico and BYU – in order to win the region title. This was the first time in NCAA Division I history that the No. 1 and No. 2 men’s and women’s programs competed at the same regional championship. Colorado and Northern Arizona emerged unscathed. The Buffs won the women’s team title by eight points over the Lady Lobos and the Lumberjacks topped the Cougars by 30. What is more impressive about those wins is the ease of victory. Colorado didn’t have a runner in the top-5 (7-12-12-14-16) and Northern Arizona put five ahead of BYU’s third. There are some caveats though: New Mexico rested Alice Wright and the Cougars ran without Daniel Carney and Casey Clinger. Wright would have probably added another top-5 runner to the Lady Lobos’ haul (New Mexico went 1-3-5 with Ednah Kurgat picking up her fourth win of the season), while Carney and Clinger – who finished 2-3 at the West Coast Conference Championships – add serious front-end power for BYU. We’ll see each team at full strength next Saturday – but for now, Colorado and Northern Arizona showed why they deserve to be at the top of the polls. Syracuse and Iona laid waste to the competition in the Northeast Region. The Orange and Gaels accounted for 10 of the 15 runners in the top-15. Syracuse won the team title with 28 points behind a 1-2 finish by Justyn Knight and Colin Bennie, while Iona – led by Johannes Motschmann (third place) – finished with 48 points. Third place in the team race belonged to Army West Point with 218 points. This was Knight’s third consecutive Northeast Region title. The Canadian is 3 for 3 this year and can make it 4 for 4 with an individual title at NCAAs next Saturday. Middle Tennessee State won its first team regional title in program history today. The Blue Raiders held off Ole Miss 71-76 to earn the top automatic bid out of the South Region. MTSU only ran five runners and went 3-5-10-23-30. Staying in the South Region, the Georgia women finished runner-up to Ole Miss and secured their first trip to NCAAs since 2012. Furman will send both its men’s and women’s teams to NCAAs. The Paladin men won the Southeast Region title after never finishing higher than third this decade. Furman’s women took runner-up honors behind NC State and improved 28 spots since 2010 when they were 30th. Virginia Tech’s men finished runner-up to Furman in the Southeast Region and continued to climb into the national conversation. The Hokies had never finished better than fourth in the region since the turn of the decade and now have a good chance at a top-10 national finish. Iowa State beat Oklahoma State for the men’s title in the Midwest Region and broke a streak of six consecutive wins for the Cowboys. The Cyclone women also won the regional title over an Oklahoma State team. San Francisco’s women put together an outstanding performance in the West Region and won the team title. The Dons went 1-4-7 with Charlotte Taylor setting a course record in the process and beat Stanford by 17 points. The Great Lakes Region and South Central Region were the only sectors where the same two programs automatically qualified men’s and women’s teams. Michigan and Michigan State will send both its men and women to NCAAs, while Arkansas and Texas does the same. Princeton’s men won its first Mid-Atlantic title since 2010. The Tigers beat a Navy squad that will make its second trip to NCAAs in a row. Penn State’s women have now gone back to back to back and Villanova’s women placed second for the second year in a row.